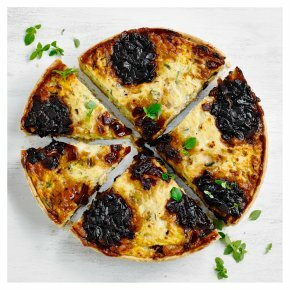 An all-butter shortcrust pastry case filled with extra mature Cheddar cheese, caramelised red onions and leeks in a rich and creamy free range egg custard. Suitable for vegetarians and delicious hot or cold, this quiche is certain to impress. Even the meat eaters will want a slice! Try it warm for a party, with a selection of salads and breads, and it's perfect cold the next day.